Trump, flanked by Tillerson and Haley, on August 11, 2017, at his golf club in Bedminster, New Jersey. In a conversation with his Bush-era predecessor Condoleezza Rice at Stanford University on Wednesday, Secretary of State Rex Tillerson revealed that he prints out the tweets of President Donald Trump so that he can take them into account when making foreign policy decisions. Tillerson went on to say that printing out the tweets is “not a bad system,” because he doesn’t know what the president will tweet ahead of time. Actually, Mr. Secretary, that sounds like a very bad system. Passing over the inherent absurdity of printing out tweets — surely one of these staffers could set the secretary up with a Twitter account and show him how to use it? — the implications of this system are troubling to anyone with a passing understanding of how international relations work: Not only is the secretary of State unaware of what the president is going to say and when, he may also be finding out more slowly than his more social media–savvy counterparts in foreign governments. This means that when Trump took to Twitter at the start of the year to engage in a nuclear button-measuring contest with North Korean dictator Kim Jong-un, it’s entirely possible that Kim read that tweet before Tillerson did. Of course, the North Koreans have figured out by now that @realDonaldTrump is not to be taken too seriously, so the odds of a rogue tweet leading to nuclear apocalypse are not high — though they’re not exactly zero, either. Of course, even if Tillerson did get an intern to set up his phone with Twitter and push notifications, that wouldn’t change the fact that the president of the United States is routinely making public statements to the entire world, which his top diplomat learns about no sooner than the rest of us. It’s not hard to imagine an unplanned tweet having consequences that the State Department is left scrambling to clean up. In fact, we don’t need to imagine: That’s just what happened when Trump hurled insults at Pakistan and declared his intent to cut off aid to that country in a tweet on New Year’s Day. The tweet reportedly blindsided U.S. diplomats, who had no warning that it was coming. Sure, Trump had vented his spleen at Pakistan in his Afghanistan strategy speech last summer, but no other president would ever have made a public statement that jeopardized our relations with a volatile, nuclear-armed ally without asking (or at least telling) the National Security Council first. Accordingly, when Trump issued his vaguely phallic dig at Kim earlier this month, key figures in the administration spent the following weekend building a world in which these tweets were part of a coherent diplomatic strategy. Tillerson defended them by saying that such bellicose rhetoric is the only kind of language the North Koreans understand. U.N. Ambassador Nikki Haley and CIA Director Mike Pompeo made appearances on the Sunday news shows to assure the nation that Trump’s tweet was simply meant to remind Kim that if he went to war with the U.S., he and his country would be obliterated — as if he were not already aware of that. You see, tweeting threats at North Korea is actually a good thing, Haley told ABC’s George Stephanopoulos, because the president “has to keep Kim on his toes.” In other words, the best way to handle a paranoid dictator with nuclear weapons and the world’s fourth-largest army is to taunt him into becoming even more paranoid. Perhaps that’s also why the administration has decided to leak that they are considering a preemptive “bloody nose” strike on North Korea, provided they can figure out how to do so without subjecting millions of innocent South Koreans to massive reprisals. 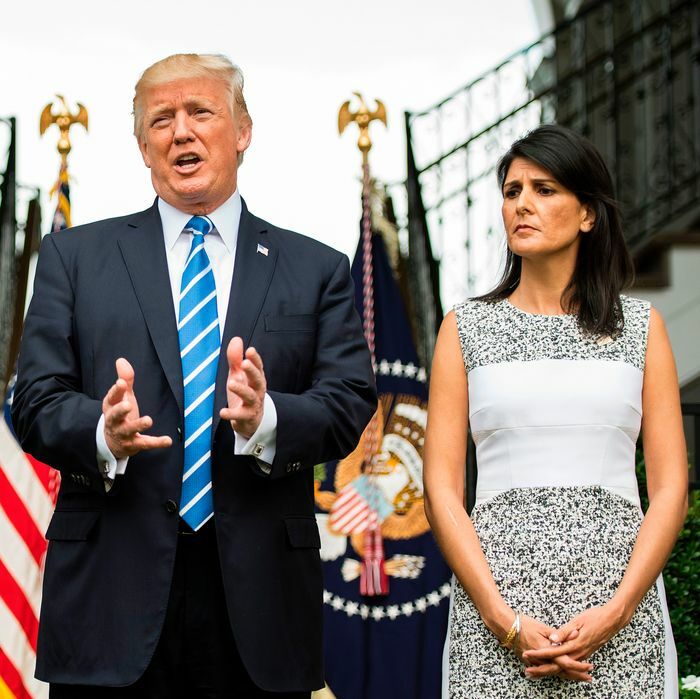 This is not the first time Haley has defended Trump’s unpredictable behavior as useful to her diplomatic efforts, but her claims beggar belief. For one thing, none of her predecessors had trouble getting the world to pay attention to the United States. And it’s hard to imagine that she, Tillerson, or any of the other “adults in the room” are actually advising Trump to hurl cryptic invective at foreign governments on social media without warning. Kim may be kept “on his toes” this way, but so are they. You can’t claim that the president’s tweets are part of your plan if you don’t know when they’re coming or what he’s going to say. That’s literally the opposite of having a plan. Not only do Trump’s tweets not follow his administration’s foreign policy strategy, they are effectively creating that strategy by forcing his diplomats to construct policy narratives around them. If Trump’s unmeasured outbursts against North Korea (among other countries) are part of anyone’s strategy, it is only in the sense that they are recurring contingencies around which his Cabinet members and their staffs must plan. That the president will periodically yell at the world without notifying anyone beforehand is now a baseline reality that the American diplomatic, military, and intelligence communities will likely have to deal with for the duration of Trump’s presidency, since Twitter refuses to shut down his account. Hence Tillerson’s defense of an approach with which he clearly disagrees and Haley’s absurd claim that she actually prefers to work for a boss who behaves unpredictably, acts on impulse, and makes decisions publicly before discussing them privately. They have to make it work, so they can’t admit that it doesn’t. Let’s just hope there isn’t a printer jam in Foggy Bottom the day Trump tweets out something really destructive.